From a failed Kickstarter to a lengthy stay in Early Access, the development of Wreckfest hasn’t been the smoothest affair for Finnish developer Bugbear Entertainment. One of the reasons why the studio’s next car game has been in development since 2012 is due to its ambitious physics engine. Everything from the dirt that cars drive on to the damage that cars take from a crash have been realistically rendered, and it’s really a sight to see. Bugbear ended up showing me the physics engine in a really cool way. This was done entirely by jumping into the game’s photo mode, which they jumped into directly after causing a wreck, and then using the camera to fly around the track. I could see all of the particles of dirt flying in the air, and looked at a car frame as small pieces broke off onto the track. It was incredibly impressive, and all of the game’s promotional shots have been created using the same tool that players will get their hands on. Making this feature even cooler is that after a race has finished, players can replay the entire race from any car’s view, and see how all of the action unfolded. When players generally think of realistic physics they expect them to be applied in a very serious simulation racing game. 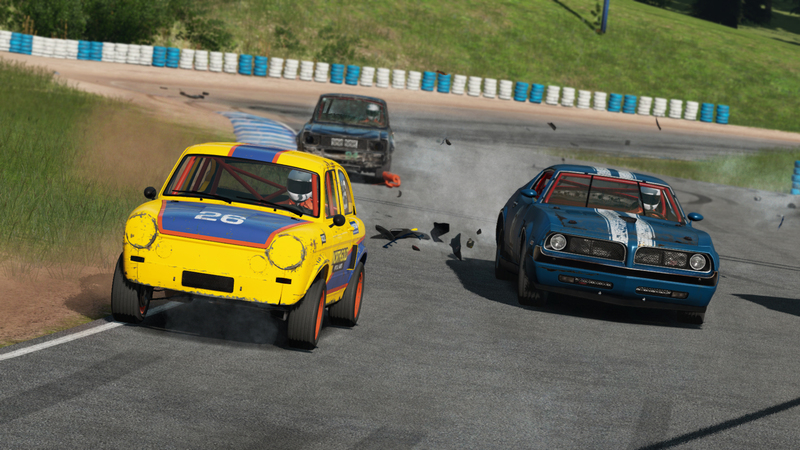 Wreckfest isn’t that, as players are encouraged to cause crashes, and knock into other players during races. It’s in a unique area between an arcade game and a simulation, but I feel like it’ll appeal to both audiences. Realistic driving is definitely on display, as I played a few races without any of the assists on, and it became an incredibly difficult racer. I ended up doing much better in races when I had some of the assists on, but tracks still require strategy. For lengthier races, players will have to carefully watch the damage that their car has taken during a race. While cars are definitely durable in Wreckfest (I ended up doing a few flips onto my hood in order to prove that), it is possible to be put out of commission if enough damage is done. This reminded me of the durability system in WipEout, where it’s important to know when the be aggressive, and when to stay out of the way. While I didn’t get to see the game’s career mode myself, I did find out about how players will progress. Faster vehicles will unlock as the game goes on, and I got the chance to drive one of the more powerful cars in the game. This provided a completely different experience from one of the earlier races I had competed in, as I was accidentally driving off the course, and struggling to reign in the vehicle. There’s definitely a learning curve here, and that’s exactly why players won’t be starting off with the best cars. I ended up playing Wreckfest with both a controller and a racing wheel. I found the game to control great with both devices, although playing with a wheel was definitely a more intense experience (which can be partly contributed to the fact that they had it running on a dope setup that had three screens). It further showed to me that Bugbear is creating a game that can appeal to any crowd, be it those that just want to have fun crashing into others or players that take their racing very seriously. While I really enjoyed the racing, I ended up adoring the demolition derby mode. Bugbear told me that one of the biggest inspirations for the game was the PS1 classic Destruction Derby, and it definitely shows. The match I got to compete in featured nearly two dozen cars, and it was as chaotic as one would expect. After a few big crashes, I started to discover there was more depth here than just crashing into the nearest car I saw (which was pretty fun). This strategy comes from targeting specific parts of enemy vehicles, and making sure your engine stays safe. Since you don’t want your car to blow up, I spent most of the race driving in reverse. This way I could go at a high speed and not do damage to my front end. My race eventually came to an early end after I went up a ramp for speed, accidentally went off it, and landed hard on the ground. It was one hell of a way to go out, even if it wasn’t in first place. Whether trying my best to race competitively or just bashing my car into everything that moved, I ended up having a blast with Wreckfest. It’s wonderful to see the high level physics simulation that make games like Forza so impressive applied to a more relaxed style of racing game. It all results in a title that is able to appeal to all types of racing fans. Bugbear Entertainment’s “next car game” has had a long, and rocky, development cycle, but it’s all coming together to be something really special. Wreckfest is set to release in 2018 for PlayStation 4, Xbox One and PC. Previewed on PC.